It was an unlikely venue for a chance meeting that would change popular music forever – the less than salubrious surroundings of a dingy nightclub beneath a Liverpool fruit warehouse. It was here of course, in the Cavern Club, that Brian Epstein, a local record-store owner and music columnist, first encountered The Beatles. The rest is history. Unfortunately, the same can be said of the original Cavern Club. It closed in 1973 and was filled in during construction work on the Merseyrail underground rail loop – a cavern of a very different kind! Major engineering works were undertaken deep beneath the streets of Liverpool between 1972 and 1977 to link and integrate the Wirral and Northern lines of the Merseyrail system. These two commuter routes, electrified with 750V DC third rail system, have been operated under the Merseyrail brand name since 1978, latterly by a train operator of the same name. Interchange facilities between these two lines were constructed at Liverpool Central and Moorfields stations. As part of what became known as the ‘Loop and Link Project’, this grand scheme included the creation of a two-mile single-bore loop-back tunnel – the Mersey Loop. Driven under the Liverpool streets at depths varying between 17 and 40 metres, this created a one-way loop line, starting and ending at James Street station. As well as increasing destinations for Wirral line passengers, by serving the business and shopping districts and Lime Street station, this new line increased capacity by allowing the seamless turn back of all services around what is effectively a balloon loop. The running line of the Mersey Loop was laid as a form of slab track, comprising concrete sleepers encased within a concrete bed. This has lasted reasonably well but, after over forty years, maintenance issues were arising. Broken and deteriorating sleepers, increasing in numbers, were notoriously difficult to change, requiring lengthy and expensive possessions. Network Rail therefore took the decision to renew the slab track. This remedial work has been undertaken in stages, typically with 200-250 metre stretches of track being renewed on each occasion. In order to improve efficiency, diminish passenger disruption and reduce costs, planning commenced in 2014 on a scheme that would see all of the remaining stretches of track, amounting to 1200 metres in total, renewed in one phase. Three tunnel track sections and four station platform sections were to be renewed during a six-month complete line closure, commencing in January 2017. Network Rail appointed Carlisle-based Story Contracting to undertake the works. In the tunnel sections, the existing 1970s slab track was formed using standard concrete sleepers set at 750mm centres within reinforced concrete plinths. The plinths were cast directly upon the tunnel invert sections, with a void formed between them for drainage purposes. A central semi-circular drainage channel was incorporated into the tunnel invert beneath. Steel walkway plates were placed between the sleepers in the four-foot to cover the drainage channel. 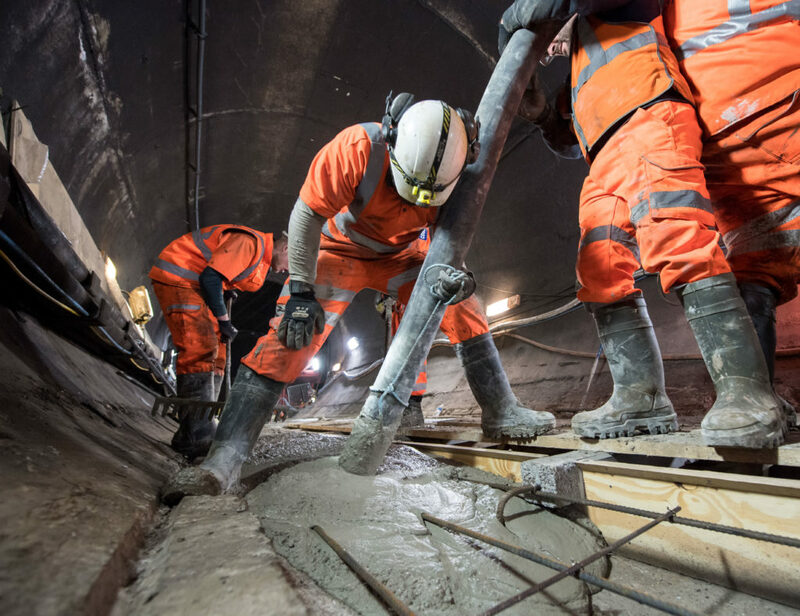 Renewal of the remaining original slab track in the tunnel sections has been completed, with the plinths being entirely broken out and replaced by new concrete haunches cast in situ. These are linked by pre-cast reinforced concrete struts. Pandrol Vipa SP base plates carry new CEN 56 rails and the drainage channel has been protected by a sectional phenolic fire integrity FRP walkway. Within the station platforms, the original track was installed as a concrete slab with a drainage pipe cast into it in the four-foot. The rails were sat on Pandrol base plates fixed into the concrete at 610mm centres. Here, the solution has been to remove the permanent way and then reduce the slab by planing, leaving the existing drainage unaltered. The slab has, however, been broken out locally for the installation of new transverse drains. Pandrol SFC base plates have been fitted by over-coring the existing bolts. The SFC baseplates offer a shallower construction depth, which reduced the slab planing depth. By using these methods, the estimated saving to Network Rail has been greater than £1 million. The single-bore tunnel also hampered operations in terms of storage areas and methodology. To avoid any storage, handling and transportation issues associated with steel rebar reinforcement, fibre-reinforced concrete was used instead. Further, by drawing upon expertise from Transport for London, Story Contracting was able to introduce lightweight FRP walkway gratings, diminishing the manual handling challenges. Similarly, the concrete struts that span between the concrete haunches were originally a 60kg two-man lift. Designer Arcadis was able to develop a more slender strut, which reduced the weight by half. Effective forced ventilation within the tunnel sections was a primary consideration. Diesel fumes and dust from the plant machinery were potentially hazardous, so a system of 14 large ventilation fans was installed to keep the air moving. The air quality was continuously monitored throughout the duration of the project. Water supplies were piped from ground level along the tunnel. Also, lighting, electricity and compressed air supplies were fixed to the tunnel wall. The four station platforms around the loop were the only areas available for storage. Their surfaces required protection by boarding and the use of geotextile membranes. All in all, two weeks of set-up time was required before work on the slab track could start. To handle the concrete deliveries, a wagon-mounted pump was positioned at the head of the Central station ventilation shaft. The concrete, brought to the site through the city centre by over thirty road deliveries, was pumped down the shaft into a static concrete mixer mounted on Story’s concrete train. This was then hauled along the tunnel, headed by Story’s rail-mounted Unimog. Adjacent to the worksite itself, a second static pump was then used to deliver the concrete, pumping it over distances of up to 140 metres. From initial mixing, a maximum work time of four hours was permitted. This took account of the transport time, the two-stage pumping operation and the actual placement into the haunches. Thereafter, the concrete mix was designed to accelerate its curing rate to accommodate the canted track and steep gradients of the slabs. 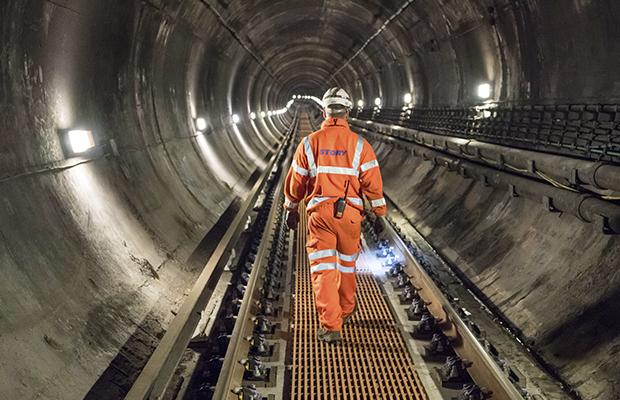 In order to prove the concept, a trial pour was undertaken on the surface, replicating the anticipated conditions in the tunnels, complete with installed Vipa plates and rails. This mock up was subsequently used for training purposes and as an induction tool for visitors. Work in the tunnels followed a set routine. Firstly, the live rail was removed, followed by the running rails, which were cut into two-metre lengths for ease of transport and to reduce handling difficulties. An RRV would then be used to break out the slab using a pecker attachment. A mini-digger would load the spoil into a bin, to be transported by RRV to the twin bore area of James Street station. Formwork was then fitted, which also supported the pre-cast struts used to link the two haunches. The three steel lacer bars were then added within each haunch before the concrete was pumped. In this way, 110 metres of slab would be formed, principally because the continuous welded rail was delivered in 108-metre strings. Rail launchers were set up in the four-foot to allow the CWR to be launched over the newly constructed slabs. The rails were then supported at two-metre intervals on alternating blue and yellow colour-coded jigs. The blue jigs set the horizontal alignment and the yellow jigs set the gauge and vertical alignment. A wire brushing technique was used to provide a key for the Pandrol Vipa baseplates which were then wedged in position with the clips preinstalled. Four 32mm core drillings were required for each base plate. The project required some 14,000 drillings to accept Hilti resin anchors. Voids under the Vipa baseplates were then filled with a Tecroc cementitious grout, cast within reusable GRP form work. Each Vipa baseplate rests on a 22mm Tecroc pad and a 10mm plastic shim. A strict Quality & Inspection Test Plan (QITP) process was followed throughout these procedures. Pull out tests were undertaken on 10 per cent of the anchor bolts, with negligible failures detected. With the rails in situ, the FRP gratings were then laid in place to cover the central drainage channel. Finally, a new conductor rail was installed using Rehau glass-fibre-reinforced supports. 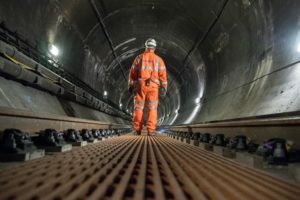 The project required over 9,500 man hours to complete, the work being undertaken on a three-shift pattern comprising two 10-hour shifts overlapping by one hour, plus a nightly maintenance shift of eight hours. In this way, productive output was maintained for 19 hours each day, with site management, cleaning and restocking occurring during the night. This also helped with the management of fatigue experienced by operatives and staff working in challenging environmental conditions. With the Mersey Loop project underway, the opportunity was taken to undertake other maintenance works to alleviate future disruption. Early in the scheme, the S&C North Alliance (a partnership between Network Rail, Amey and Rhomberg Sersa) undertook switch and crossing (S&C) renewals at Hamilton Square. Later in the project, the S&C Alliance returned to carry out heavy refurbishment of S&C around Mann Island junction (adjacent to James Street station) and the renewal of 1,100 metres of plain ballasted track under the Mersey. The value of the Mersey Loop scheme was £8.75 million and hand back occurred, on budget and on time, on 19 June. 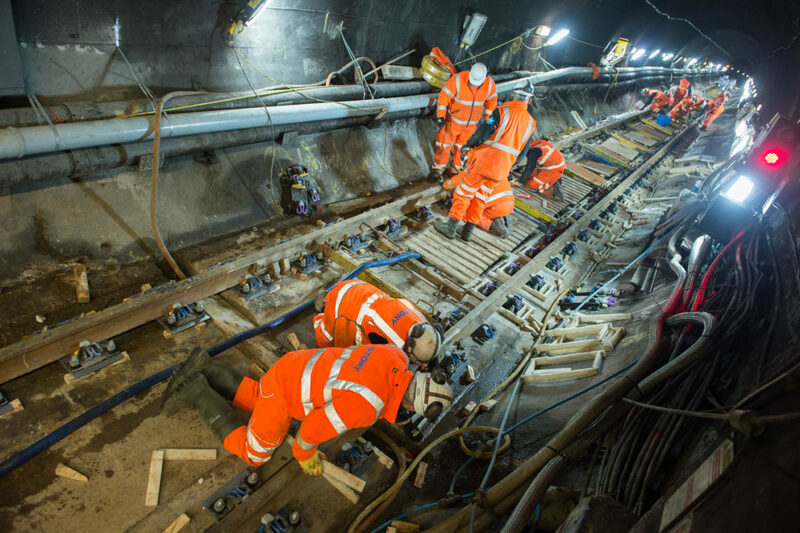 A major factor in the success of the project was the involvement by Story Contracting of experienced specialist contractors that had worked on previous phases of track slab renewal. This ensured that the knowledge and equipment was available to undertake the work safely and to a high standard. The lifespan of the new track slab is expected to be at least 60 years and the use of the adjustable Pandrol Vipa baseplate system means that track gauge, top and line can be easily maintained. The investment in new maintenance-friendly track will support a new Merseyrail fleet on the network. Bespoke four-car FLIRT (Fast Light Innovative Regional Train) units, built by Swiss manufacturer Stadler Rail, will be introduced from 2020. Indeed, the Mersey Loop project forms part of a £340 million investment in the Liverpool City Region’s rail network over the next three years – a combination of funding from Network Rail and the Liverpool City Region Combined Authority, via the Government’s Growth Deal fund and Merseytravel. Due to the Loop and Link Project, the original Cavern Club cellars may have been destroyed in 1973, but happily a new Cavern Club was opened in 1984, having been built nearby to a similar floor plan and using many of the bricks from the old club. 2017 marked the Cavern’s 60th anniversary and celebratory events are taking place throughout the year. Rock and pop is alive and well on Merseyside, although there’s not much in the way of shake, rattle and roll down in the caverns of the Mersey Loop. Story Contracting’s excellent track alignment sees to that! Written by Stuart Marsh for Rail Engineer.